Figure 1. Distribution of new cotton virus disease in Alabama. virus (US-CLRDV) (genus Polerovirus, family Luteoviridae), was identified in samples collected from Barbour County. dwarf virus in Alabama (CLRDV-AL). Currently, whole genome sequences of US-CLRDV isolates collected from Mississippi and Georgia are being completed to compare identities across the southeast United States. Figure 2. Leaf rugosity or puckering along with yellow veins in shoot terminal. Sample tested positive for CLRDV. 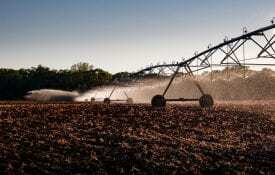 In Brazil, yield losses of up to 80 percent have been reported for susceptible cultivars. 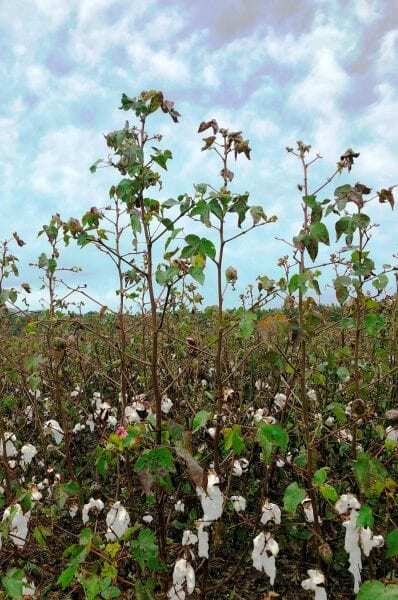 On the basis of observations made in producer cotton fields across Alabama, yield loss to the CLRDV-AL strain in 2017 was estimated at $19 million. To date, the virus has been detected, through molecular methods (PCR) in samples collected from commercial fields and AAES outlying units in 24 counties across cotton producing regions of Alabama (figure 1), along with multiple counties in the cotton producing regions of the Florida Panhandle, Georgia, and Mississippi. 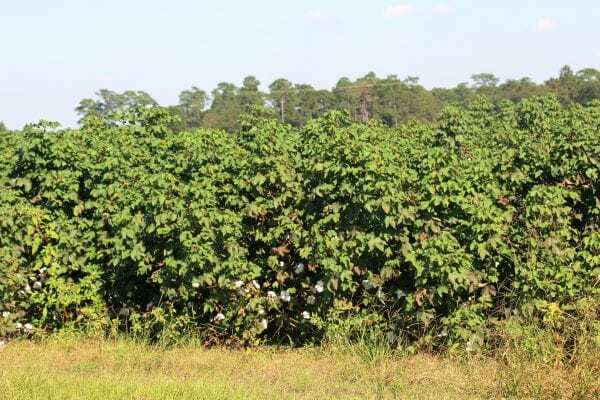 Incidence of symptomatic cotton plants approached 100 percent in some commercial fields in southwest Alabama. The CLRDV genome encodes six predicted coding regions, or open reading frames (ORFs), ORF0 to ORF5. The ORF0 encodes for a putative viral suppressor of host gene silencing and the majority of mutations in the genome. When compared to isolates from South America, the ORF0 was found to be the most divergent among the ORFs, but not sufficiently divergent to be considered a new species. The ORF0 sequences from sixteen isolates collected from across Alabama representing different symptomologies and geographic locations were compared to determine if differences were observed. The ORF0 sequences were almost identical, indicating that the same viral strain is present across Alabama and is most likely a recent introduction to the southeast United States. Figure 3. Upward cupping of juvenile leaves. Sample tested positive for CLRDV. Cotton blue disease (CBD), caused by the typical CLRDV strain, was first described in Africa in 1949 and more recently in Brazil, Argentina, India, Thailand, and Timor-Leste. Infected plants exhibit stunting due to shortened internodes, leaf rolling, leaf petiole and vein reddening, distorted juvenile leaves, reduced flower and boll size, and sterility. In Brazil during 2006, a new or atypical CLRDV strain was identified in CBD- resistant cotton. Virus infected plants exhibited mild CBD symptoms characterized by red, withered leaves and accentuated verticality (i.e., long terminal whips with numerous blank fruiting nodes). 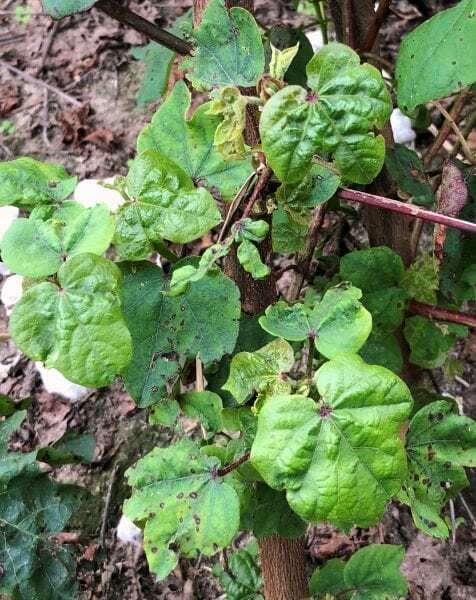 The new US-CLRDV virus in Alabama cotton is related to the above typical and atypical strains of CLRDV, although it is most closely related to the atypical strain. lateral shoot terminals (figure 2) along with upward or downward cupping of the leaves (figure 3) and red to maroon discoloration of leaf veins (figure 4) were first observed. Similar leaf symptoms were also noted in Alabama cotton in 2017. Noticeable rugosity along with cupping of leaves on regrowth emerging from the base of mature virus-infected cotton was also common in October and November (figure 5). Aphid feeding alone can cause leaf curling and cupping, and whitefly feeding can cause leaf deformation. In addition, reddish to maroon discoloration of the petioles and stems just below the shoot terminals with shortened internodes in a zig-zag pattern have also been observed (figure 6). Figure 4. Red to maroon leaf midveins. Sample tested positive for CLRDV. Severely damaged plants develop a Christmas tree or triangular shape with elongated whips or shoots with many fruiting nodes and squares, which were later shed and resulted in few blooms and bolls set on the main terminal whips and lateral branches (accentuated verticality) (figures 7 and 8).Failure of diseased plants to retain squares and set blooms or bolls on the whips, which was consistent across a limited range of commercial cultivars, was likely responsible for top crop loss. Occasionally, shedding of nearly mature bolls was also observed. Severely stunted, nonboll bearing plants collected in Escambia County tested positive for the virus. Figure 5. Rugosity and downward leaf roll on adventitious shoots at base of mature cotton. Sample tested positive for CLRDV. Like other Polerovirus species, this new virus is transmitted by the cotton aphid (Aphis gossypii) in a persistent and circulative manner. Alates can transmit the virus in as little as 40 seconds, and viruliferous aphids can transmit up to 12 days. Whiteflies, which have become a serious pest in Georgia cotton and occasionally in adjacent states, do not transmit CLRDV or related poleroviruses. While this virus is aphid transmitted, intensive insecticide programs directed at controlling this insect pest will not result in a reduction of virus spread to fields when aphids initially colonize the crop because insecticides will not kill aphid vector before they can transmit the virus. A disease incited by the fungus Neozygites fresenii in early summer kills the majority of cotton aphids in cotton. 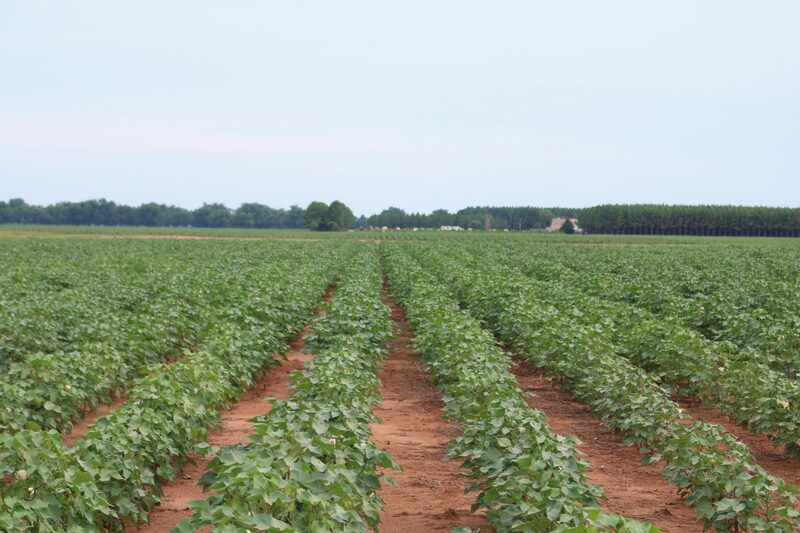 When cotton aphid populations exceed the treatment threshold established by Alabama Extension, recommended insecticides should be applied as needed. As was previously noted, disease incidence and subsequent symptom severity in 2018 was much greater in late-planted cotton. As a result, cotton in areas of Alabama at high risk for infection should be planted in early to mid-May. 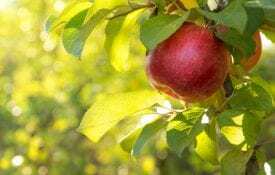 Early planting, which may increase the occurrence of boll rot and hardlock in South Alabama, has previously been recommended as a tool for managing CLRDV. Figure 6. 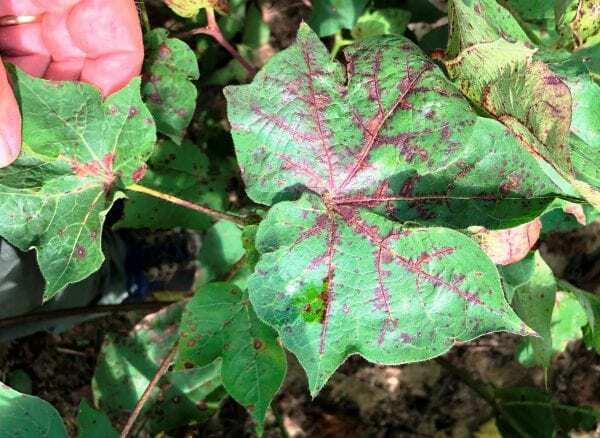 Symptoms of CLRDV in Alabama cotton include red to maroon discoloration of leaf petioles and terminal shoots with shortened internodes and sometimes pronounced zig-zag growth pattern. Long term, establishment of resistant cotton cultivars will be the best defense against poleroviruses like CLRDV and its relatives. 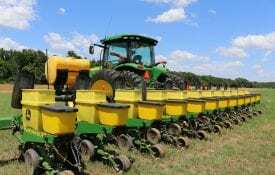 Seed companies have germplasm with resistance to one or both CLRDV strains, which to date has not been deployed in the United States. So far, the few commercial cultivars exposed to US-CLRDV have shown no resistance. However, some regulated breeding lines being evaluated in the United States do carry CLRDV resistance markers, so adapted, virus-resistant commercial cultivars may soon be available. Currently, cotton cultivars marketed in Argentina and Brazil are resistant to the typical strain of CLRDV, while a few also have atypical strain resistance. However, the response of cotton germplasm with resistance to the CLRDV strains found in South America to isolates of the US-CLRDV has yet to be established. Henbit (Lamium amplexicaule), a common winter weed, has been found to be a natural host of CLRDV and likely plays a role in the overwintering of the virus . It’s likely that other winter annual or perennial weeds will also be shown to be hosts of the virus over the next few months. These weed hosts are a likely overwintering site and source of primary inoculum of US-CLRDV. Several species in the Malvaceae family have been reported as hosts for CLRDV and under experimental conditions Cicer arietinum, Hibiscus sabdariffa, and Sida acuta have been reported as hosts. The cotton aphid is a polyphagous species and is also reported to feed on plants in the Malvaceae family, but there is limited information on host-use patterns in the southeast. While not all of the overwintering host(s) in the United States have been identified, an aggressive weed control program around field borders and nearby ditch banks may be helpful in delaying virus movement from overwintering hosts into cotton. In addition, producers are also advised to kill volunteer cotton, which may serve as a bridge between the overwintering host and newly planted cotton crop, with herbicides or tillage equipment. Figure 7. Advanced symptoms of CLRDV in Alabama cotton include elongated often bare terminal whips or shoots with normal boll set in lower and mid-canopy. Figure 8. CLRDV-AL diseased cotton exhibiting the Christmas tree or pyramidal shape with elongated terminal shoots (accentuated verticality) with a dense leaf canopy. Notice the absence of blooms and open bolls in the upper canopy. 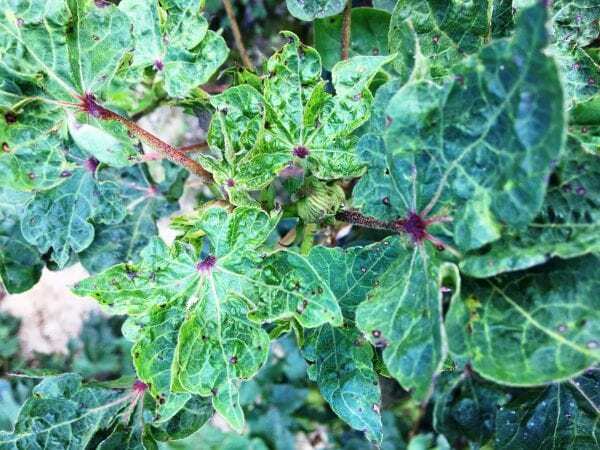 Download a PDF of A New Virus Disease in Alabama Cotton, ANR-2539.